British Columbia is a land of mountains. It's no wonder that BC is home to some of Canada's finest ski hills and world class ski resorts. From Alpine downhill to Nordic cross-country, winter time is ski season! 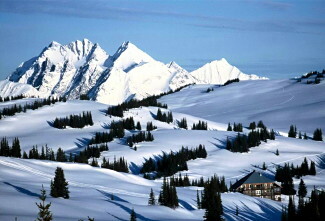 British Columbia ski vacations can be as accessible or as remote as you wish. Modern BC ski resorts located in bustling ski villages offer every amenity imaginable, as well as shopping and nightlife. Wilderness backcountry ski lodges offer cozy comfort miles from the crowds. Solitude and unmatched beauty. Ski down groomed slopes, cross-country trails, or discover the adventure of powder skiing the mountians on a heli-ski or cat skiing adventure. Whichever you prefer, you can find it among the list below of BC Ski Resorts and British Columbia Ski Vacations.